In this article session, we’ll provide you with an on-page SEO checklist and some tips to strategically target keywords on your web pages. If you’ve got content on your site that doesn’t intentionally target any keyword, keep reading! You will learn how to capitalise on those opportunities, discovering where and how to optimise your website content. 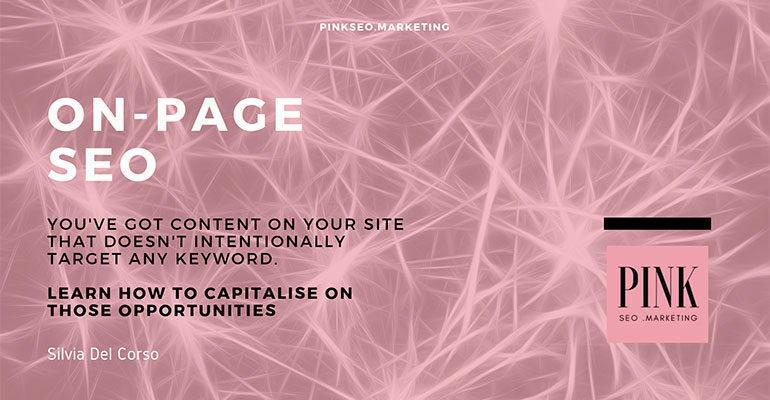 When you start planning the optimisation of your website, you want to go through all of your pages and make sure that each targets a specific keyword. You can create your Keyword-to-Content Map with a basic Excel spreadsheet (you may use a Google Excel Sheet if you want to share it with someone you’ll be working on this project with). Most SEO professionals have more or less complicated templates that they can share with you, or you can create your own. Basically, you’ll have to list all the URLs and the pages you want to be found on Google, and for each, the keyword you want them to be found for. This is a very strategic phase, in which you need to consider to invest enough time. is one of the decisions that can truly make a difference in your online visibility and, eventually, revenue. I’m glad to assist you with professional Keyword Research and consultancy if you might need. These 2 lists need to match and be related in a one-to-one relationship, meaning that each page needs to target one main keyword and each keyword needs to have a dedicated page. keywords without a dedicated page, that you will have to note down as a future task to create. Now that your Keyword-to-Content Map is ready, is time to learn how to create and/or optimise the pages accordingly. So, here are some on-page SEO tips, in the form of a very simple and straightforward checklist. So, your selected keyword should be present here. Unless you do optimise those points on purpose, it’s extremely unlikely that your page will be found randomly for the right keywords that will grant you a targeted website traffic, that can convert into your online goals (check this guide to determine which ones they are and how to set up your goals on Google Analytics). The competition is now so high in every niche and industry, that you do have to work on purpose to make sure the pages are as optimised as you can. The Yoast SEO Plugin for WordPress can help you see an on-page SEO checklist in the form of coloured dots that resemble a traffic light. We will now explain each of the points in detail with a step-by-step on-page SEO checklist. Check if your focus keyword is in your heading. 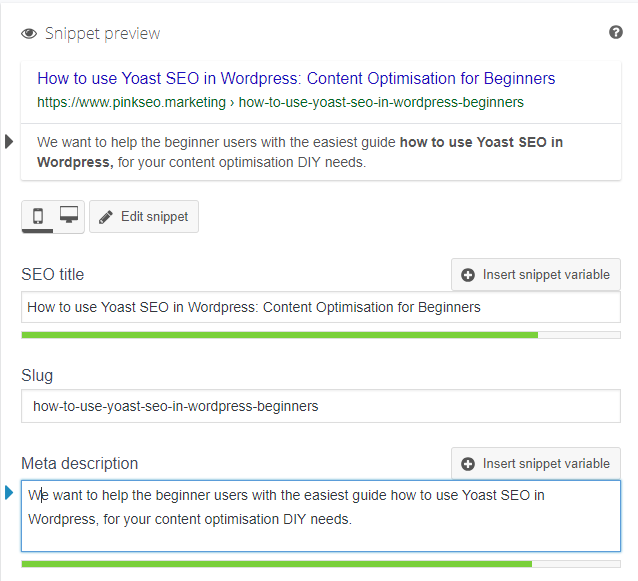 The Yoast plugin will flag as a green dot (meaning as good) if the focus keyword appears in the SEO title and this has a nice length. Google typically displays the first 50–60 characters of a title tag. Keep your titles under 60 characters, and they will generally display properly. you use those keywords in a very natural way: no keyword stuffing, ever, please! the text between the subtitles is made up by paragraphs of around 3 to 5 sentences, max. You’re encouraged to keep the text to 300 words or less (but we’ll see later how this is way too short for your page to be really able to rank in most cases!) So, when you’re planning your content, think of a subheading as two separate paragraphs (of 150 words each or less), or a few shorter ones. Read more about the importance of subheaders for Readability in our Yoast SEO guide part 2: Readability Test for beginners. Some website owners told us they didn’t even realise meta descriptions mattered. Actually, a well-crafted meta description can make the difference between an impression and a click (the so-called CTR or click-through-rate), making your site’s prospective user want to read more! So, Make it worth clicking! and possibly containing the focus keyword. The number of displayed characters has been changing a few times over this year. However, if you keep it around 120-158 characters it should be displayed entirely. Yoast will flag as a green dot if the images on the page have alt attributes containing the focus keyword and red if no images appear. In this case, you’ll be prompted to consider adding some as appropriate. To add alt attribute in an image, select it in the Media Library and add it as shown in this screenshot. Yoast will flag as a green dot if your keyword also appears in the URL for this page. We suggest you keep a nice length less than 50-60 characters. Generally, as regards a URL, the shorter the better, also for the readability in some sharing contests. You might be suggested by Yoast, as a potential improvement, to remove “stop words“. Search engines won’t consider them, and they make your URL longer. So try and provide the best possible User Experience. For UX and SEO purposes, we suggest you try and match URLs to titles most of the time (when it makes sense). However, if your title includes stop words, it’s not critical to put them in. Use your best judgement on whether to include or not based on readability vs. length. In your on-page SEO checklist, when it gets to changing the URL to include the focused keyword, if you need to rename a previous URL, you need to pay attention: if you change the URL you might break a link, creating a 404 “Page not found” error. For this reason, you need to make sure you have installed a Redirection plugin and set it up so that it automatically notices 404 errors and redirects them to the new URL you chose. A free, good and easy plugin for this is Redirection. It is the most popular redirect manager for WordPress. It will help you reduce errors and improve your site ranking. The aim of your pages is to create interesting content, which provides enough information to your users. Although it was still 2014, when Google’s Senior Webmaster Trends Analyst, John Mueller declared that: “keyword density, in general, is something I wouldn’t focus on. Search engines have kind of moved on from there”, still, nowadays it is not unusual or infrequent to read about it when discussing an ideal on-page SEO checklist. Yoast, for example, will indicate in some cases that the exact-match keyword density is too low. In fact, they encourage you to aim for a keyword density range of 0.5% to 2.5%. Actually, you have to consider that there is no IDEAL %. Obviously, search Engines crawler bots need to find a good match between the query that the user is searching for and the content of your page. Yet, you should try and focus on including synonyms (for Latent Semantic Index purposes). Check this article about Google’s Rankbrain, to understand how this machine-learning algorithm actually works and its impacts on your SEO. Yoast will report how many words your copy is made of and will recommend a minimum of 300 words. It will prompt you to add more content that is relevant to the topic if you wrote fewer words. Personally, we tend to recommend to consider twice as many, considering how competitive the web is nowadays. Much probably, most of your competitors’ sites have longer, more relevant pages. These can outrank your content. So, aim to 500-600 words at least. As an SEO Consultant, I can let you know in detail how many words should each piece of your content consist of, to be really competitive, analysing the pages that are currently ranking in Google top 10 positions for the keywords you’d like to rank for. Contact me for a free consultation on your off and on-page SEO plans. Check this video for a FREE SEO training session to understand what is Cornerstone Content (and how to create Topic Clusters). If you consider your page to be “cornerstone content” (your most important ones), Yoast suggests a minimum of 900 words. Once again we recommend exceeding if you can make it in a natural, very engaging and useful way! Although it belongs to the off-page SEO, as well, we couldn’t help mentioning link building in our on-page SEO checklist. Do link your pages between each other internally and with third-party websites, too! Links are the “streets” the crawler bots “run” on. So, let them (and your users!) reach as many pages of your site as you think relevant, and create connections with other (high-quality) businesses by linking your sites together! We will talk about off-page SEO more in other articles. For the moment, consider linking your site with high-quality sites, as part of informative, editorial pieces of content, as a short guideline. Share this FREE on-page SEO checklist guide with any website owner or professional who might be interested in learning about Search Engine Optimisation concepts. Please, let me know in the comments if you liked it and do not hesitate to contact me if you have any questions, or if you’d like some assistance with your SEO projects!